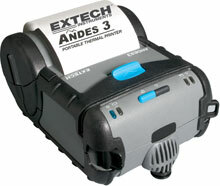 The Extech Andes 3L has been discontinued. No direct replacement is available. The Extech Andes 3L series is a 3" (80 mm) heavy duty receipt and label printer that includes RS-232, USB, Shoulder Strap, Lithium Ion Battery, 1 Thermal paper Roll, Universal AC Adapter (180-minute Fast Charge) and a 1 year warranty that includes the printhead.